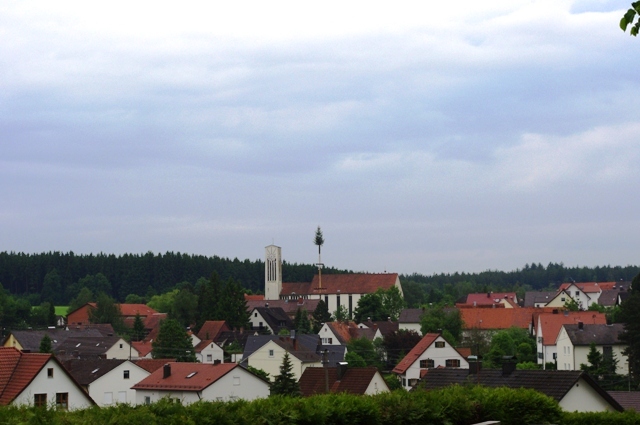 I am just back from Germany — again. My aunt passed away. She was the last of my mother’s siblings. She was 92. Tante Martha was an awesome lady. She worked for over 40 years in a local factory. She lost her husband to a heart attack after a relatively short marriage and never remarried. She enjoyed gardening and watching soccer with her nephew . Her house was always spotless. 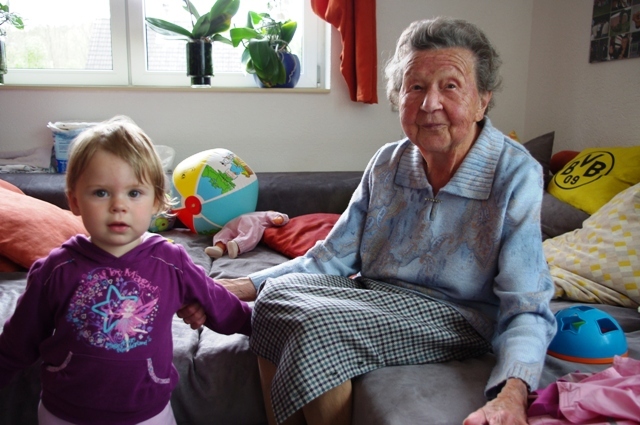 In her final days, she enjoyed playing with her great-great niece. I visited Germany often through the years. One story Martha told over and over was about her visit to West Chester in 1981. 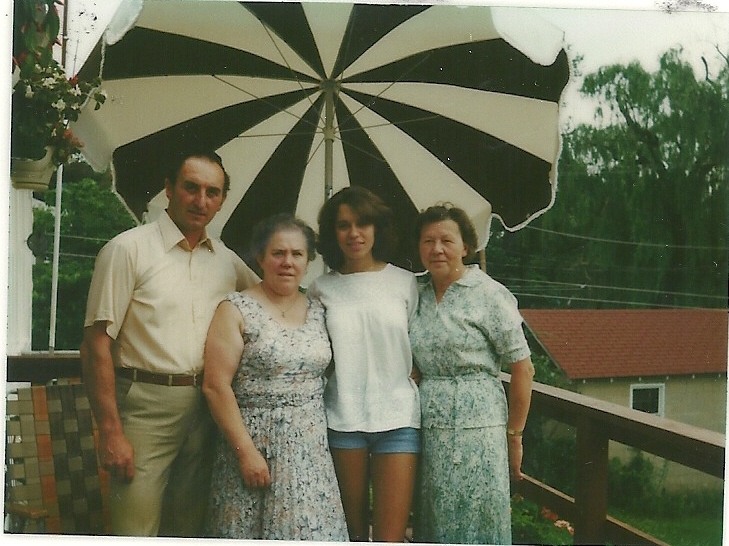 She remembered everything – the house, the garden, and the names of my dozen or so siblings. 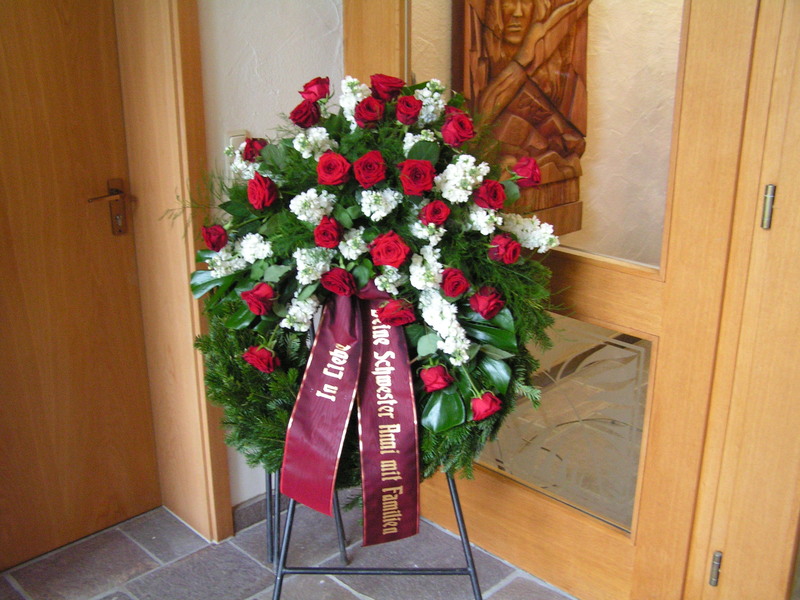 German funerals are different than in America. The biggest difference is that the body of the deceased is not embalmed. 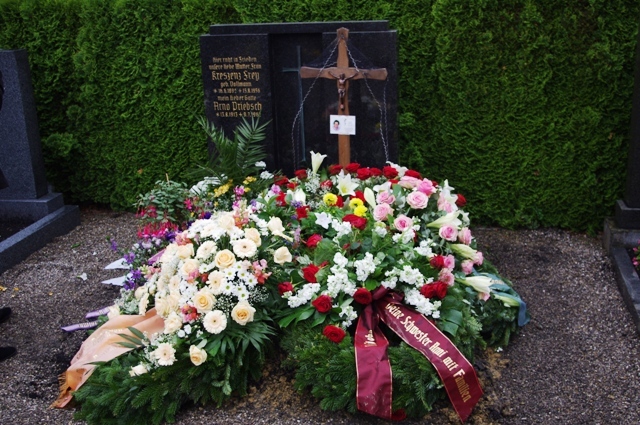 In our village, Strassberg bei Bobingen, the deceased must be buried within 3 days. The practice of preserving the body began in ancient Egypt with mummification. Embalming was also practiced by the Incas in Peru and the Chineses Han Dynasty. The modern practice of embalming developed during the American Civil War in order to transport the bodies of the soldiers to their homes. I learned alot about this by watching HBO’s Six Feet Under. Doubtless, you can read more about it online. It’s really interesting. We arrived on Friday. On Saturday, the casket was opened for a private family viewing. 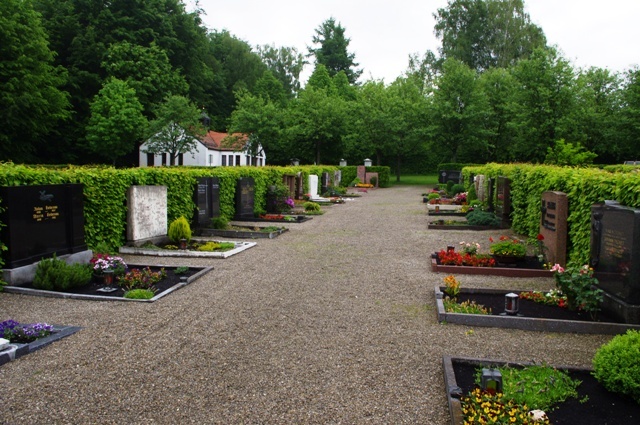 The viewing of the deceased is not common in Germany. 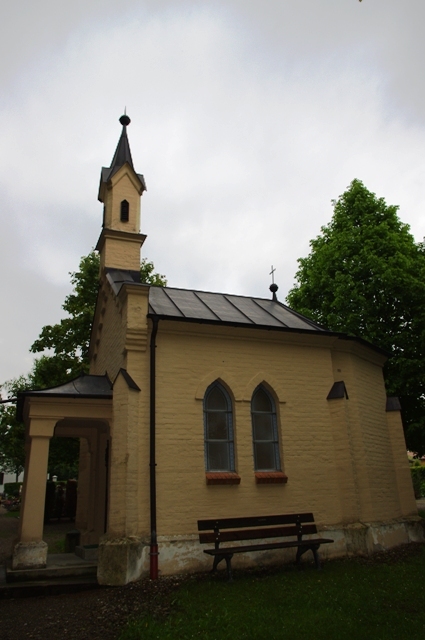 The casket was housed in a small building at the cemetery. Until the funeral is held, one may enter the building at any time to view the casket through glass doors. As flowers are delivered, they are placed in the vestibule outside of those doors until the funeral. 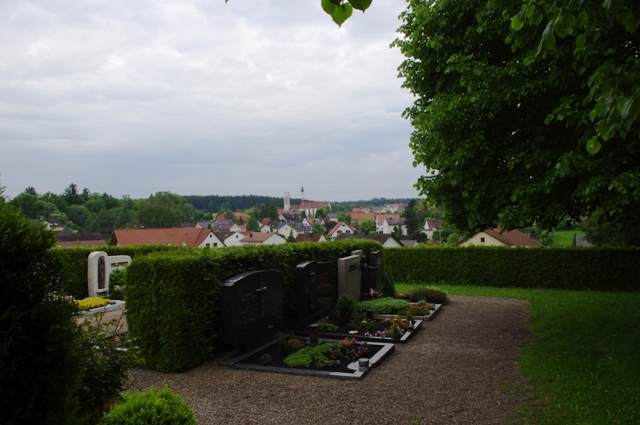 The cemetery sits up on a hill with a view of Strassberg below. In the distance, one can see the steeple of the Church. On Sunday evening, a rosary service was held at the Church. I came prepared with the Hail Mary and Our Father written in German. But this congregation prayed the rosary a little differently, adding a new line to the Hail Mary with each decade. The prayers were almost like songs – with half of the church praying the first half of each prayer and the other half of the church responding with the end lines of each prayer. The funeral service was held on Monday. If I understood correctly (my German is not perfect), the funeral is usually held within three days of the death. (Remember – no embalment.) Funerals can be delayed for special requests. In our case, Mom and my sister were flying in from West Chester. A full mass was celebrated at the Church. Unlike in America, the casket remained at the cemetery and was not brought to the Church for the service. Afterwards, the full congregation walks in a procession from the Church to the cemetery. The priest, Father Dr. Florian Schuller, led the procession along with three others who carried the Strassberger flag. It poured rained. The graveside service was quick. The casket was lowered with ropes into the grave. 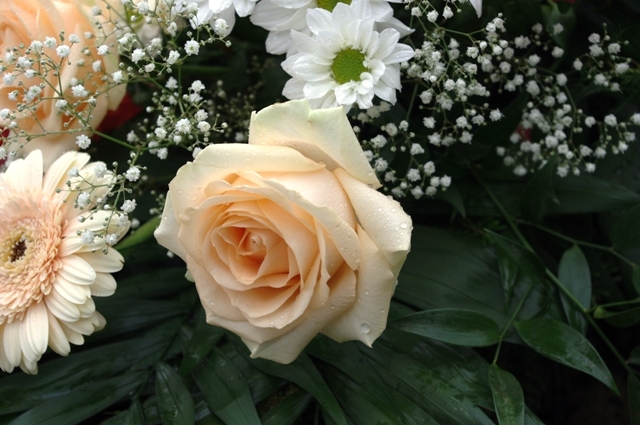 The immediate family paid their final respects and tossed a white rose into the grave. I was told that this was not common in all of Germany. 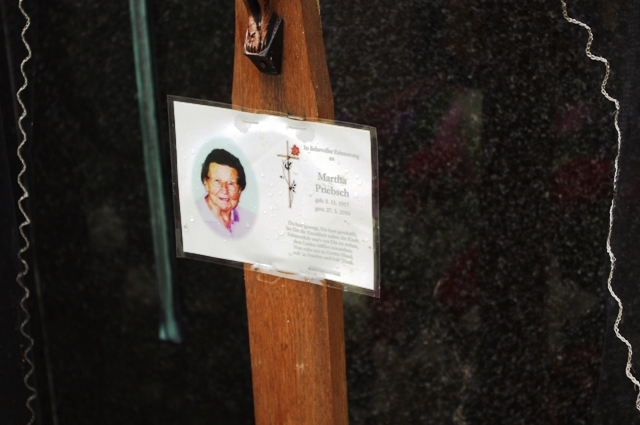 Friends and family of Martha passed one-by-one to the grave, sprinkling holy water. In our neighborhood cemetery, each grave has a small vessel containing holy water. There is also a blessed candle on each. I don’t know whether other cemeteries are as lovely as ours in Strassberg. Here, families take pride in tending the flowers on the grave. One is prettier than the next. It is a peaceful, beautiful place to visit at the edge of the forest. We returned to the house for coffee. As in American, many go out to eat or gather at a home after the service. My family decided not to do that. We had few visitors that day, but many throughout the week. 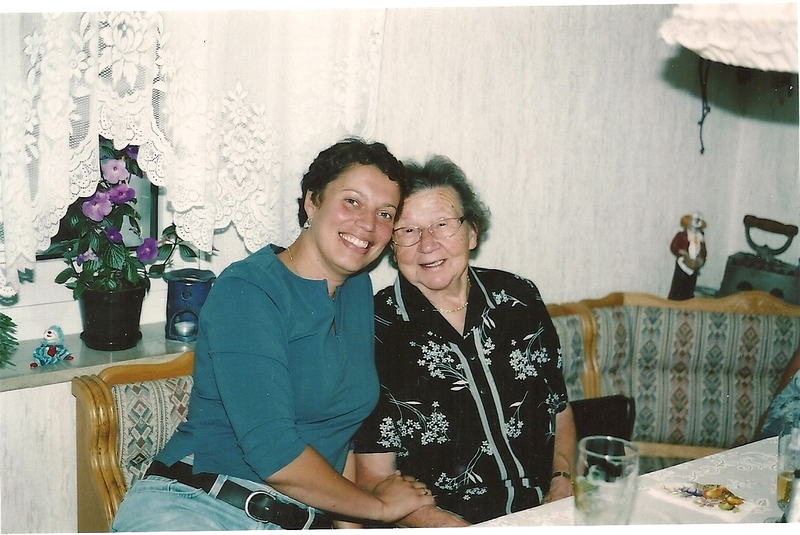 Tante Martha was well-liked in Strassberg and will be dearly missed. 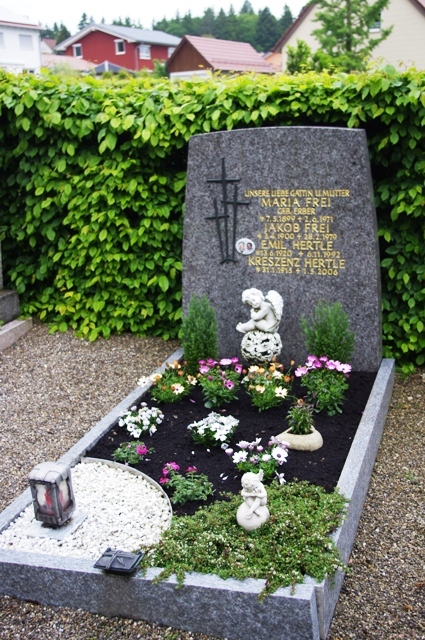 Lovely tribute to your Tante Martha. I think the Italians are very devoted to the graves of their loved ones Terry. They plant flowers, bring fresh ones, etc. They also have an eternal light burning at the graves. This is very nice to see, especially for those of us who were not able to attend. May Tante Martha rest in peace! My condolences to you and your family. It was interesting to see how the German Catholic services are different. Let me know when you would like to get together again. Thank you Terry very beautiful. May she rest in peace. She looks like such a lovely lady.